The Orion City Towers complex is now open for bookings. Custom designed to suit the dreams and needs of a modern business and the first of its kind in Sri Lanka, the building is part of the master plan of the Orion City IT Park – Sri Lanka’s largest one-stop hub for innovation and collaboration. Holding company Orion City is a recognised provider of premium commercial and office infrastructure, known for its built-to-specification, state-of-the-art commercial and office infrastructure. The company intuitively understands the needs of businesses with a model that brings together cutting edge technology and international standards, making it the preferred provider of business infrastructure. The Orion City Towers are located on Baseline Road in Colombo 9, in close proximity to the country’s commercial capital. It offers a total rentable area of 250,000 square feet, with 20 floors – each of 23,200 square feet in area. The building is equipped with six passenger lifts, a car park lift and a service lift, with ample office amenities available. 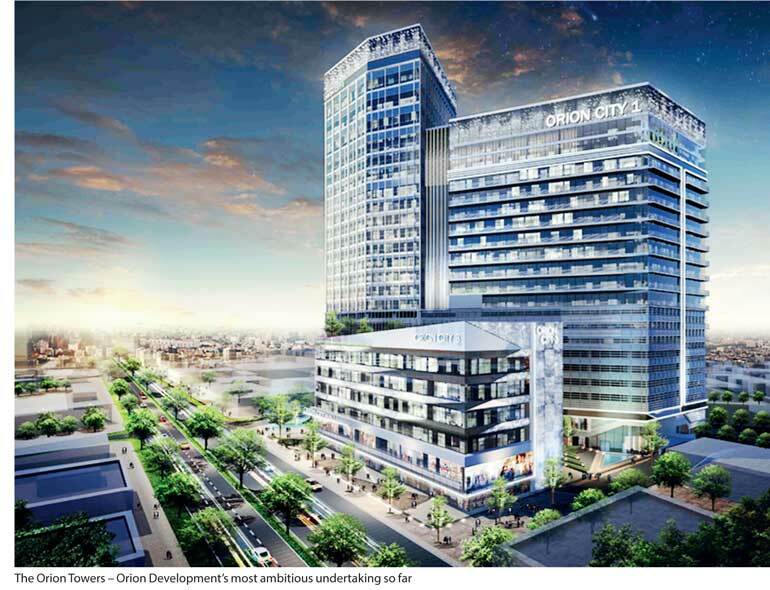 The completed Orion City Towers will also include an executive club with a business centre, lounge areas, meeting venues and private dining facilities. The Executive Lounge at the top-most floor hosts a fully-equipped gymnasium, meeting facilities and an exclusive rooftop terrace garden with stunning views of the city. The complex will also include a boutique hotel with B&B, ideal for hosting corporate visitors. Orion City Head of Marketing Jehanki Anandha noted that the Towers are slated to be a one-stop hub for innovation and collaboration. “The Orion IT Park is the first ever city within a city concept in Sri Lanka, and we envision it as the hive of innovation and entrepreneurship. This will be a space where we nurture growth, amply supported by the unique IT/BPO industry infrastructure services we provide here.” As Sri Lanka modernises its growth model, IT and BPO services are at the forefront of the shift to the service sector. Many firms are already beginning to relocate their businesses to Sri Lanka-particularly as the HR and operational cost per person is lower when moving to the country. “We are very pleased to declare this space open for bookings. For the first time in Sri Lanka, corporate visionaries have a space that has been custom designed to help them innovate-and follow through,” noted Gnanam.